The global market for pain management is poised to expand by more than $15 billion in the next five years. 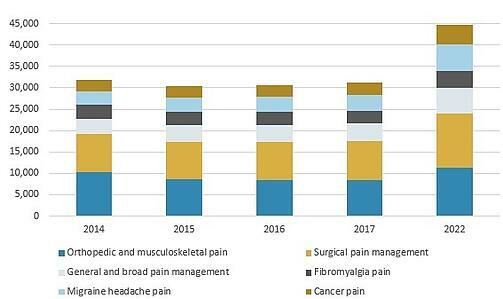 Pain management constitutes a diverse market of products and services to alleviate pain, with the potential to attain $52.0 billion annually by 2022. A recent study by BCC Research examines this industry’s prospects for pharmaceuticals and devices. Manufacturers have attempted to create well-rounded and advanced products to give clinicians a wider range of choices for pain management. As regulatory and cost issues reduce hospital stays and increase home care and other forms of long-term care, awareness of the real costs associated with pain management is growing. From $35.5 billion in 2016 annual sales, the global market is forecast to expand at a five-year compound annual growth rate (CAGR) of 7.6%, according to BCC Research’s report. Prescription pharmaceuticals include several market-leading pain management products, while the device segment offers a different approach to pain treatment. Together, these segments are expected to generate a market valued at $36.1 billion in 2017. The aging population, steady increase in the incidence of chronic diseases, education in proper pain management and attention to improving palliative care are factors that will fuel growth of this industry. 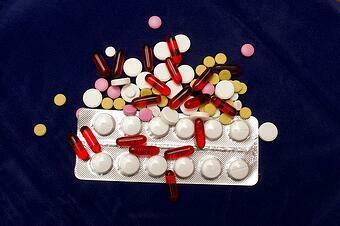 The global pain management market can also be evaluated in terms of application. BCC Research’s study focused on the following types of pain: surgical, orthopedic and musculoskeletal, migraine, fibromyalgia, cancer, neuropathic, HIV/AIDS, burn, dental and general. Combined, these segments comprise the $36.1 billion global pain management market for 2017. Surgical pain is the largest segment for pain control and management, with an estimated $9.1 billion for 2017. This is followed by orthopedic and musculoskeletal pain, at $8.5 billion. These two segments are largely driven by the volume of procedures or prevalence of conditions associated with the markets. In recent years, abuse of controlled prescription drugs has become a significant concern in the regulatory, law enforcement and medical communities. In 2015, approximately 2 million people in the United States alone were addicted to opioids. In an effort to address this problem, states are increasingly turning to electronic prescription drug monitoring programs (PDMPs). Typically, PDMPs collect prescribing and dispensing data from pharmacies and healthcare providers, enabling regulators and physicians to review the data to detect illicit prescribing and dispensing patterns. In some states, the physician can access their state’s PDMP from their office and determine within minutes whether a patient is obtaining prescriptions from multiple practitioners or pharmacies. Recently, medical boards across the country have supported the PDMPs, working with pharmacy boards, law enforcement officials, medical associations and other groups to put into action the programs. Determining whether there are gaps or inconsistencies in pain management best practices among federal agencies. Proposing recommendations for addressing gaps or inconsistencies. Providing the public with an opportunity to comment on any proposed recommendations. Developing a strategy for disseminating information about best practices. Technology and policy developments are driving budding industry segments within the drugs of abuse testing market, such as home and school drug testing. The global drug testing market is projected to increase from nearly $3.1 billion in 2017 to approximately $3.9 billion in 2022. Pharmacogenetic testing is one potential way to help identify optimal opioid dose needs. Some patients with severe chronic pain may require higher doses of opioids for pain control due to genetic variations found in their pain receptors. According to results of a study presented at PAINWeek 2017, a high percentage of patients with severe chronic pain had genetic variations in dopamine receptors and a low variation in opioid receptors, possibly explaining why some patients may require increased doses of opioids for pain control. The study performed genetic testing on 70 patients with severe chronic pain who were unresponsive to standard medical therapy, analyzing 16 single-nucleotide polymorphisms. The four categories of genetic markers included in the panel were receptor binding and activity (including dopamine, opioid, serotonin and galanin receptors), neurotransmitter transporters, central nervous system enzymes and cytochrome P450 enzymes. The growing regulatory environment for pain therapies, coupled with their demand, has resulted in a complicated market environment. Awareness of issues and trends affecting the market and how to remain compliant while providing pain therapy will be the near-term focus. Trends and issues in the pain management industry include those related to treatment, financial aspects, professional matters, and population and demographic data. For more research and market forecasts about pain management, download the report overview for Global Market for Pain Management Drugs and Devices (HLC026F).